The win streak is over. The Pirates 10-game winning streak ended with a 2-0 loss in the series opener against Houston Friday night. ECU (22-7, 6-1 AAC) is no longer undefeated in AAC play in large part because Houston (13-7, 3-4 AAC) starter Lael Lockhart stifled the ECU offense. Lockhart kept the ECU offense at bay the whole way. He threw 7.2 scoreless innings and only allowed four hits, while allowing just one walk. 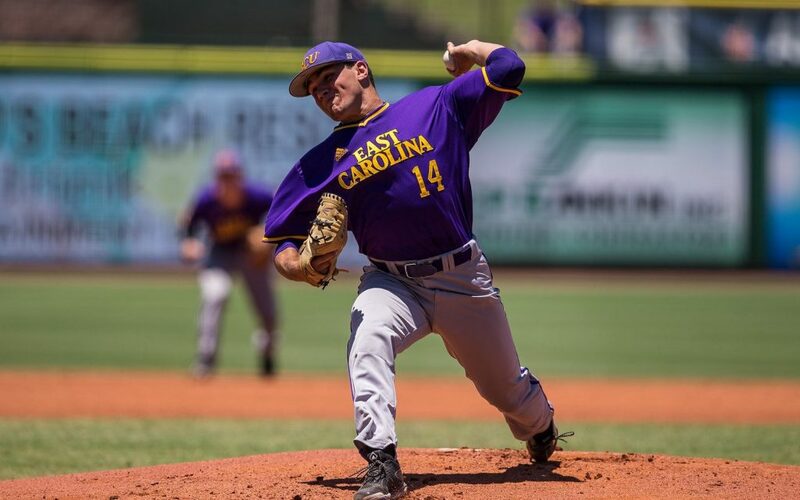 ECU didn’t get its first hit of the game until a Brady Lloyd infield single in the fifth. It was just not the Pirates game, and this was evidenced perfectly in the fourth inning. ECU had Spencer Brickhouse at second with one out in the fourth. Alec Burleson hit a fly ball to left field where Houston left fielder Rey Fuentes made an incredible diving catch. Fuentes then proceeded to throw it in and double up Brickhouse at second base to end the inning. Lloyd and Bryant Packard were the only Pirates with multiple hits, two a piece, and Brickhouse had the other hit with a ninth-inning double. The Cougars got their first run of the game on an errant throw by Lloyd to second base in the first inning. The second run came in the third inning on a solo home run by Jared Trioli. Jake Agnos still pitched well. Agnos recorded eight strikeouts, his seventh straight start with at least seven. Agnos went 5.2 innings, giving up the two runs on six hits and three walks. From there, the bullpen kept the Cougars from stretching the lead any further. Cam Colmore and Ryder Giles each threw one scoreless inning and Zach Barnes threw a third of an inning. The offense just couldn’t muster any runs. It could have been much worse, as Houston left 14 runners on base throughout. ECU stranded seven runners of their own. On top of only getting five hits, ECU managed to draw just two walks. The rest of the series is altered due to weather. The two teams will now play a doubleheader on Saturday beginning at 2 p.m. and will no longer play on Sunday.